Dean was born in Newcastle under Lyme and now lives in Audley. Dean attended Newcastle under Lyme College to gain A Levels. He then went onto Leeds University to gain his Second Class Honours (First Division) Degree in Architecture. 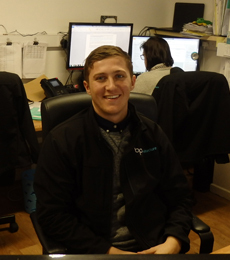 Dean was Architectural Assistant on the Newstead Academy project during his work experience with us. Dean has experience in Education, Residential, Community and Infrastructure projects together with 3D visualisations. Dean originally joined the Practice in May 2016 to gain work experience having partially completed a Degree in Architecture. In June 2017 Dean returned to the Practice after completing his Part 1 Degree in Architecture at Leeds University. Dean is a keen Health and Fitness enthusiast.